After this long hiatus on rook endgames we will finally come back to continue where we have left off. Previously, we have focused mainly on endgames where the tussle between rooks revolves around a lone infantryman. Today, we will extend our discussion to include cases where there is more than one pawn on the board. If one is familiar with the basics of chess, the he or she will remember the rule that when down on material, trade pawns instead of pieces. This is because when everything is traded off, the true executioners of the enemy king are not the pieces, but the pawns (due to their ability to promote). 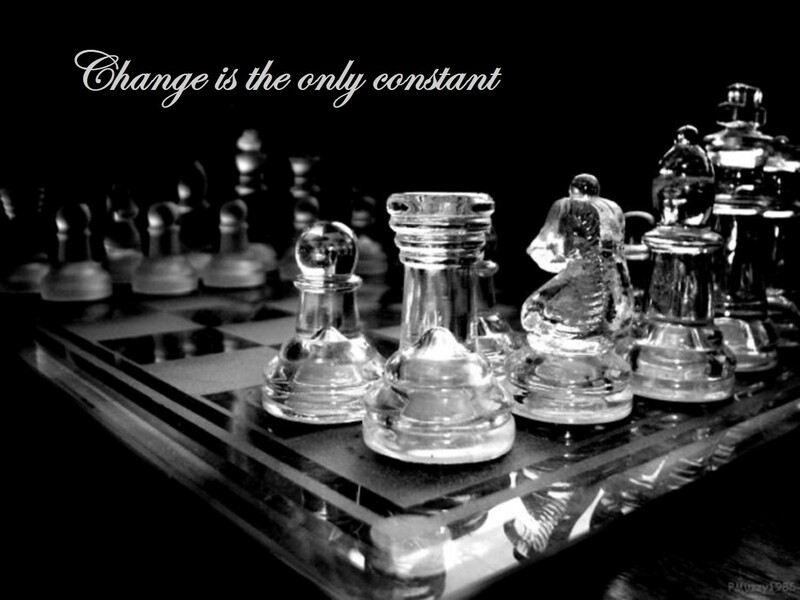 Thus, in the majority of endgames, the weaker side's drawing chances are improved with every pawn trade, and this is true especially for rook endgames. For the next few articles, we are going to look at rook endgames where all the pawns are on one side of the board (i.e. neither side has an outside passed pawn). 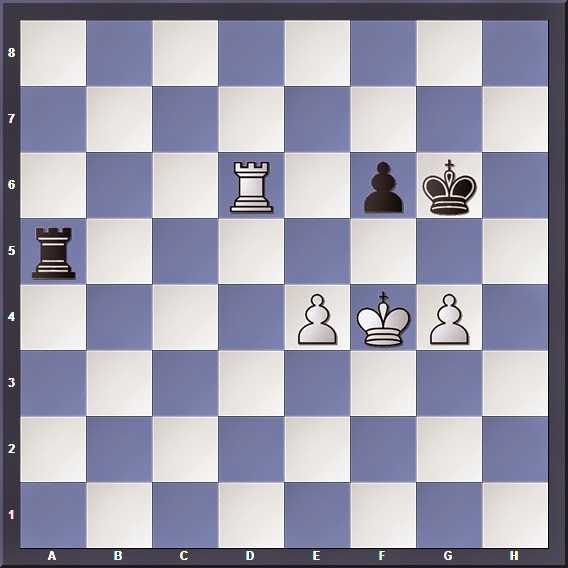 If the stronger side is only a pawn up, his opponent has some good drawing chances: The drawing plan here is to reach a Philidor/Inverse Philidor position which is an easy draw. Keep the rooks on the board. 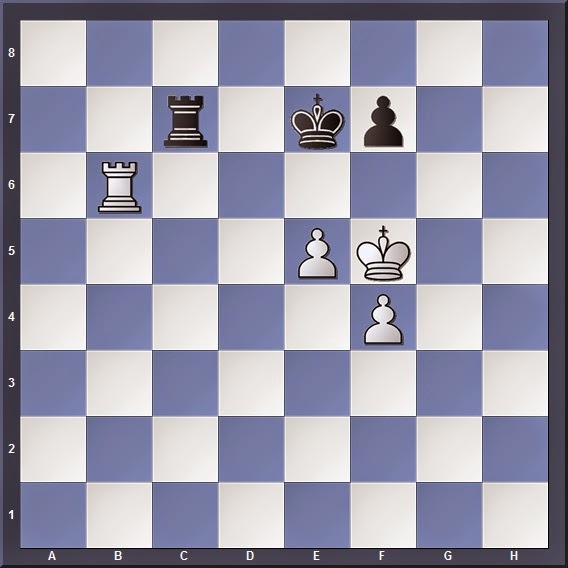 Trading of the rooks at early stages of the endgame only makes it easier for the opponent to reach a winning king-pawn endgame. In general, the weaker side should only trade rooks if he sees that the resultant king-pawn endgame is an obvious draw. Keep your rook as active as possible. That means using it to tie down the enemy king to the defense of his pawns. Sitting on the sidelines gives a passive rook which we know by now is a death sentence in rook endgames. Get your king in front of the enemy pawns. Remember that if the king is cut off it becomes easier for the stronger side to acquire a winning Lucena Position. Trade pawns, unless doing so severely weakens your pawn structure. With each pawn trade the defender's chances of getting a Philidor/Inverse Philidor Position go up. Threatening 2. f5 when White's pawns squeeze Black into a cramped position. The idea as a defender is to NEVER let yourself get squeezed, because that forces your king and rook into a passive position that becomes a nightmare to deal with. To prevent this, Black threatens the hanging e-pawn should the f pawn advance. Such is the benefits of keeping your rook active! 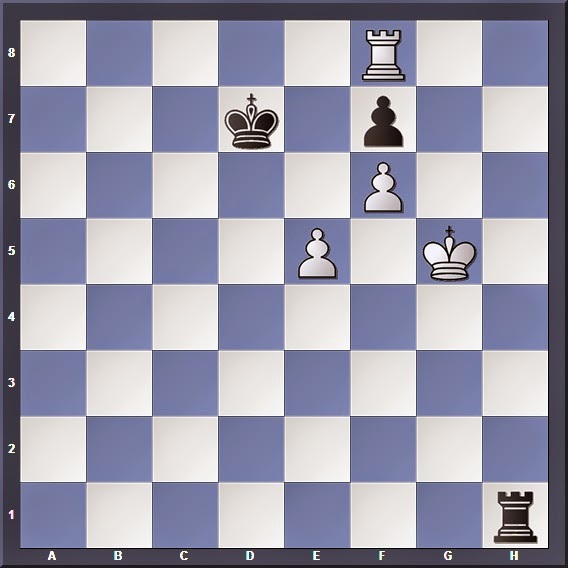 The simplest way to draw; White cannot hope to win the pawn and escape the back-rank checks at the same time. On the other hand, both 6... Ke6 7. Re8+ Kd5 8. e6 and 6... Rh7 7. Kg4! (Zugzwang: Any rook move allows Rxf7 while any king move allows Re8 followed by Re7) 7... Kc7 8. Re8 (preparing 9. Re7 followed by the decisive 10. e6) both lose for Black. 2... Ke6?? 3. f5+! Kxe5 4. Re7+ Kd6 5. Rxf7 and Black is losing since his king is no longer in front of the enemy pawn. 3. Kf5 Rc6 repeats the original position, while after 3. Kh6 Rc6+ 4. Kh5 f6 Black is able to trade pawns and get an easily drawn rook endgame (Black's king is in front of the enemy pawn, while White's king is offside). Back rank defense: A familiar motif to many of us by now. After 5. Rb8+ Black can safely trade rooks because the resultant king-pawn endgame is a dead draw: 5... Re8 6. Rxe8+ Kxe8 7. Kg7 Ke7 8. Kg8 (8. f6+?? Ke6 and White is in a losing Trebuchet position! See http://nushsblackknights.blogspot.sg/2013/11/a-simple-case-of-zugzwang-trebuchet.html for more details) 8... Kf6 9. Kf8 and neither side is going to make any progress. 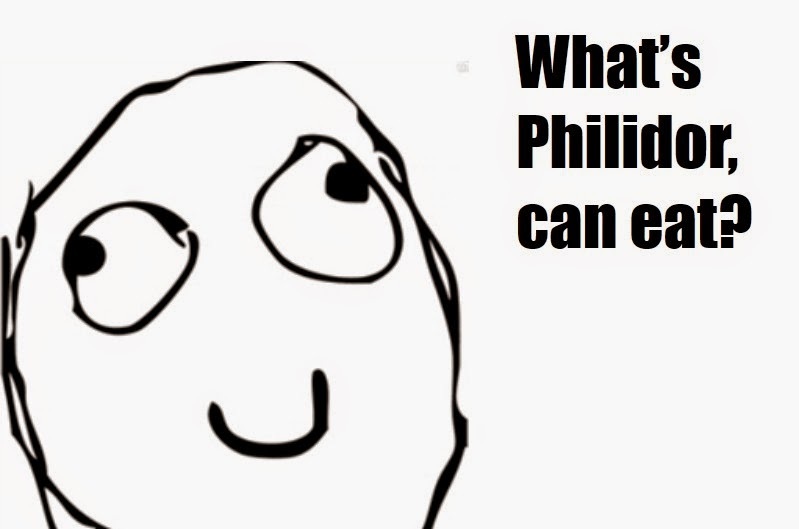 We have reached an Inverse Philidor position. 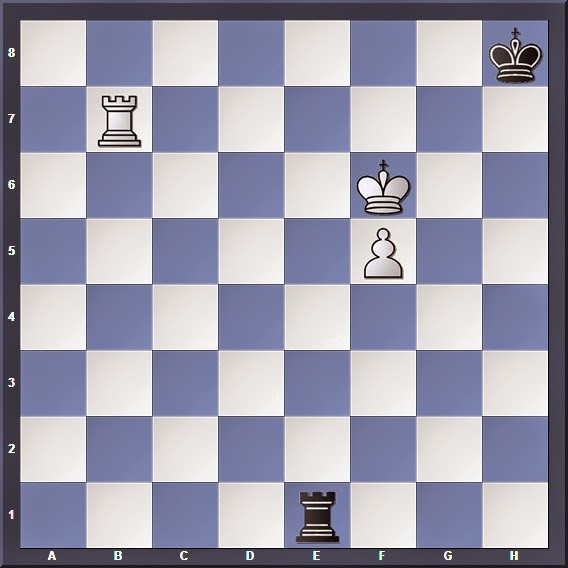 The key idea of tying the king down to the defense of its pawn. Now, I will leave the remainder of the drawing technique as a revision exercise for y'all to try out. Here, Black cannot afford to wait passively with something like 1... Re7? because after 2. f5 White puts a squeeze on his opponent: 2. f5 Re1 (Back-rank defense, but it doesn't work over here as White's king can find shelter) 3. Rb7! Kg8 4. Kh5 threatening 5. Kg6 winning the pawn. Instead, Black has the saving move 1... g6! that freezes White's pawn majority. Now, any rook checks just leads to Black's king shuffling along the last two ranks, while 2. Rf6+ Kg7 also makes no progress. Here, Black can once again exploit the fact that after trading a pair of pawns, his king can easily get in front of the remaining pawn and create a drawn Philidor/Inverse Philidor position. Otherwise Black just shuffles his rook along the 5th rank. 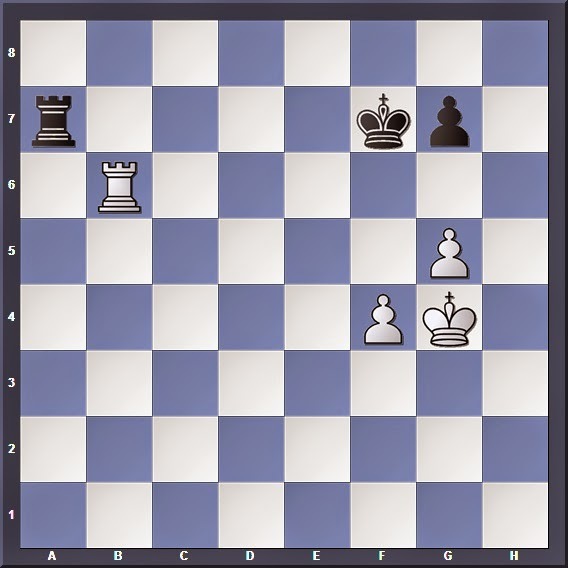 And with his king in front of the enemy pawn, Black should be able to hold a draw with little difficulty.